Why you should never complain about anything – with anecdotal proof! 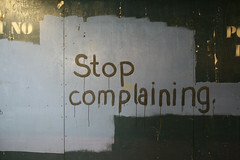 My new commandment: Never complain about anything. Ever. If you feel the need to complain to pressure someone else to make something happen, then be honest and call it manipulation. I realized this while at a client meeting; we were talking about problems with a botched sales program and the staff had a litany of complaints about the program (ed. note: it was created by a separate vendor years ago, and the fault lies with the now-departed project manager who designed something inappropriate. It does a masterful job of integrating legacy systems from different vendors, languages, platforms, a mainframe and Europeans are involved somehow, but the user interface is wanting. But I digress…). Then I remembered hearing the same litany of complaints a year ago. Unlike last year, I offered suggestions on how to make small improvements to the program. Everyone proceeded to ignore me and continued complaining. At the end of the meeting everyone felt a lot better once they had talked about their problems. No one made any plans to actually fix the problems. Then I had the realization, (to me anyway) that, complaining makes you feel better and this is why you should never complain! Complaining cures the short term rage and anxiety caused by the problem while sapping your motivation to actually fix the problem. The end result of complaining: Much short-term anxiety, and then the problem either continues or recurs. You never solve the problem. Therefore never complain, and let the problem eat away at you until it hurts enough to be worth fixing permanently. It is the only way you’ll have the motivation to arrive at a permanent fix for the problem. Disclaimer, I have not read A Complaint Free World, though I’ve heard it is quite good. And upon further reflection, part of this thought was inspired (yet again!) by Derek Sivers. This entry was posted on Thursday, April 1st, 2010	at 12:15 pmand is filed under Aspie, Biz, History & Theory, Misc, Productivity, Sentiment	. You can follow any comments to this entry through the RSS 2.0	feed. You can leave a comment, or trackback from your own site.